Every year my cousin sends me a box of fresh lemons from his backyard lemon trees in Arizona. 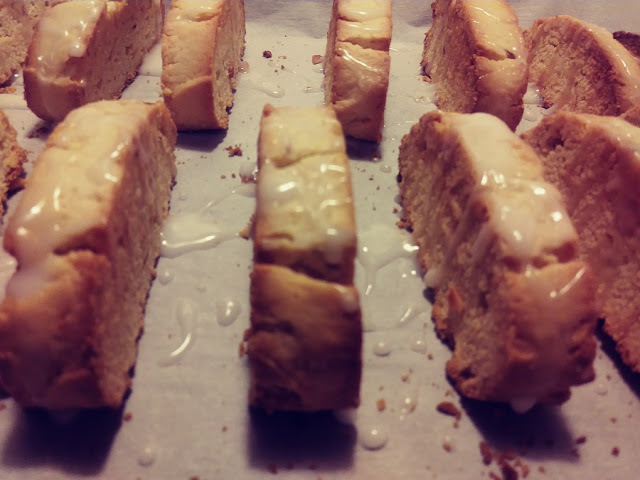 So, I put them to good use with these Glazed Lemon Almond Biscotti. The lemon and almond are a delicious combination of flavors for biscotti. If you're not a fan of almond flavor you can leave it out. 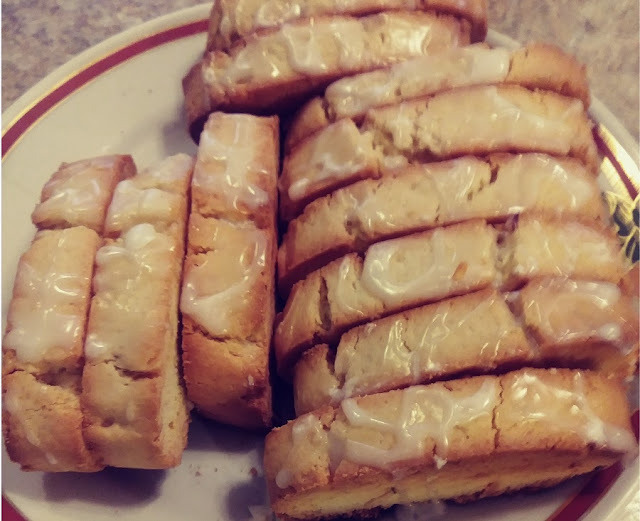 I like lemon so I also made a lemon glaze for my biscotti. Biscotti is a perfect treat if you're having friends over for coffee or tea. 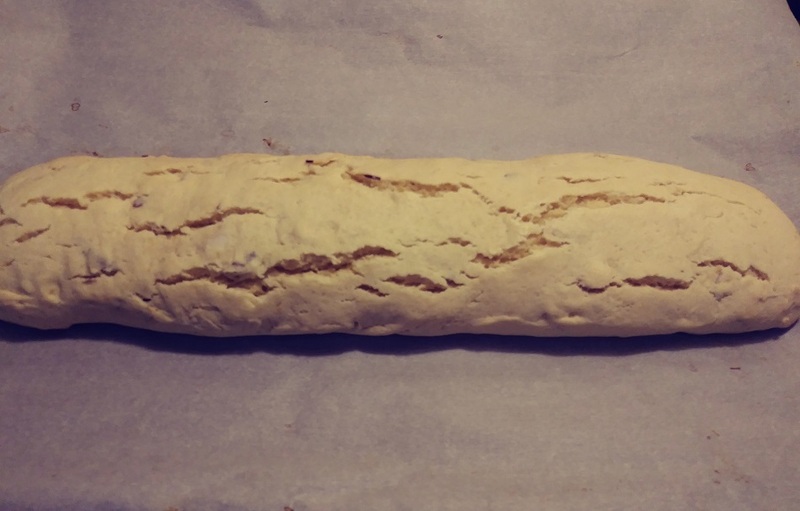 And, biscotti is really not difficult to make. 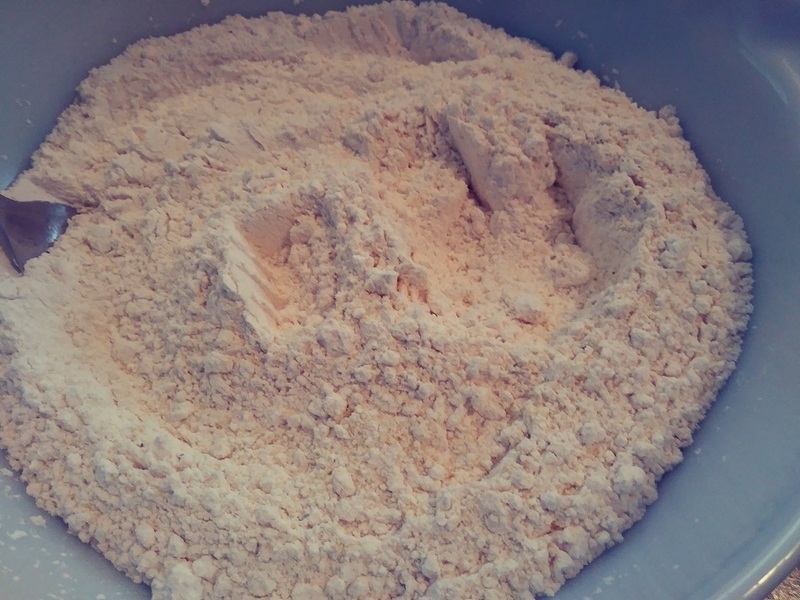 In a large mixing bowl, I beat together the sugar, butter, lemon rind, salt, baking powder, and almond extract. I used my hand mixer until the mixture was smooth. Next, I added the lemon juice, eggs, and almond slicers. I Continued mixing until they were combined. Turning the mixer to low speed I added the flour and mixed until a sticky dough formed. Because the dough is a bit sticky it's best to shape the biscotti log right on a piece of parchment paper. I shaped the log to 14" long x 3" wide x 3/4" high. 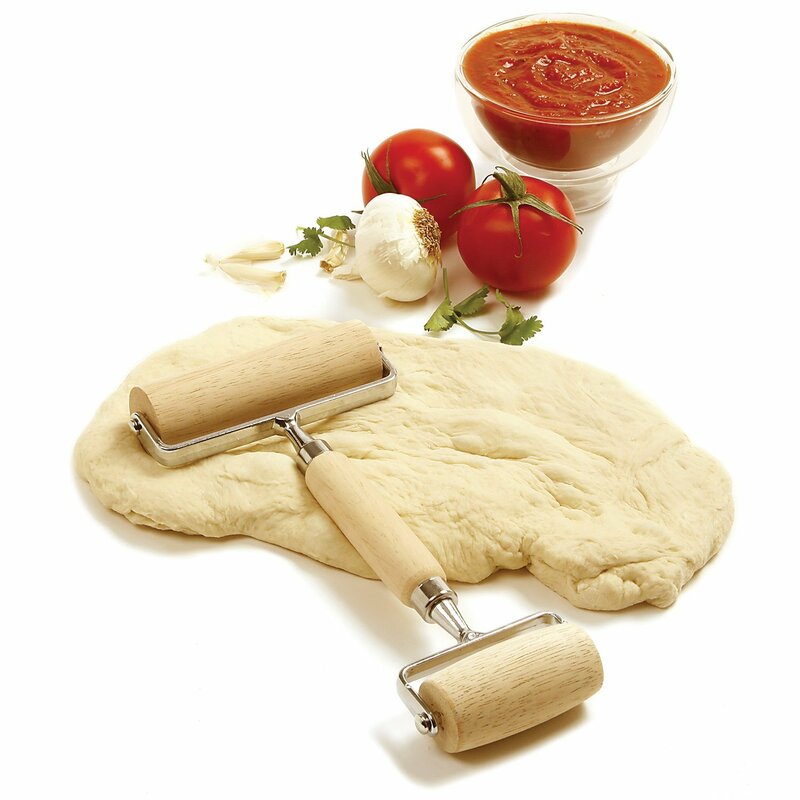 Tip: It helps to use a wet spatula to shape the sticky dough. 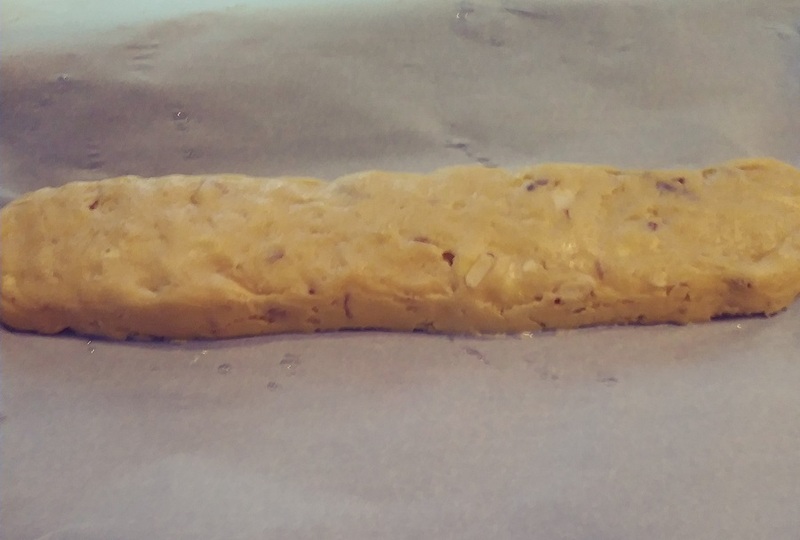 I place the log on a large cookie sheet and baked it at 350 degrees for 25 minutes. Then I removed it from the oven and let it cool for about 30 minutes. Notice that I had some cracks on top of the log. I can assure you this does not affect the flavor of the biscotti at all. After the log was cooled I brushed it with lukewarm water and waited for about 5 minutes before slicing it into 1/2" slices. The warm water helps soften it to make easier to slice. I turned the oven down to 325 degrees and prepared another cookie sheet with parchment paper. I set the slices on their side and baked them for 12 minutes per side for a total of 24 minutes until they were golden. I whisked this together in a small bowl and drizzled the glaze over the top and down the sides of the biscotti. 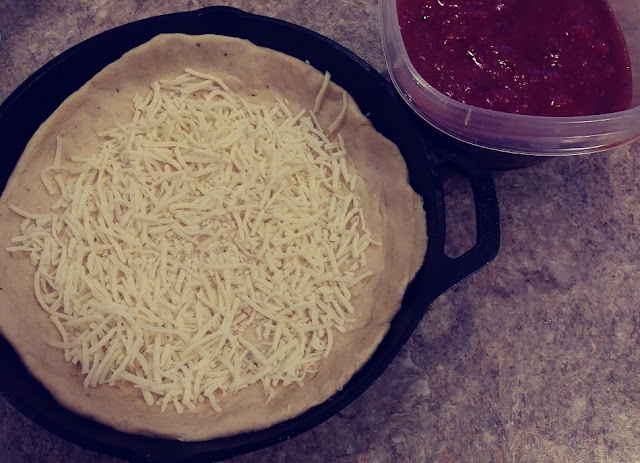 I've been wanting to make my own cast iron deep dish pizza ever since I visited Chicago some years ago. If you're ever in Chicago don't miss trying the famous Chicago style deep dish pizza. I enjoy cooking in my cast iron skillets so I thought the deep dish pizza was a perfect fit. Pizza is just one those dishes that is so versatile. Choose the toppings that you like meats, veggies, and even fruit. 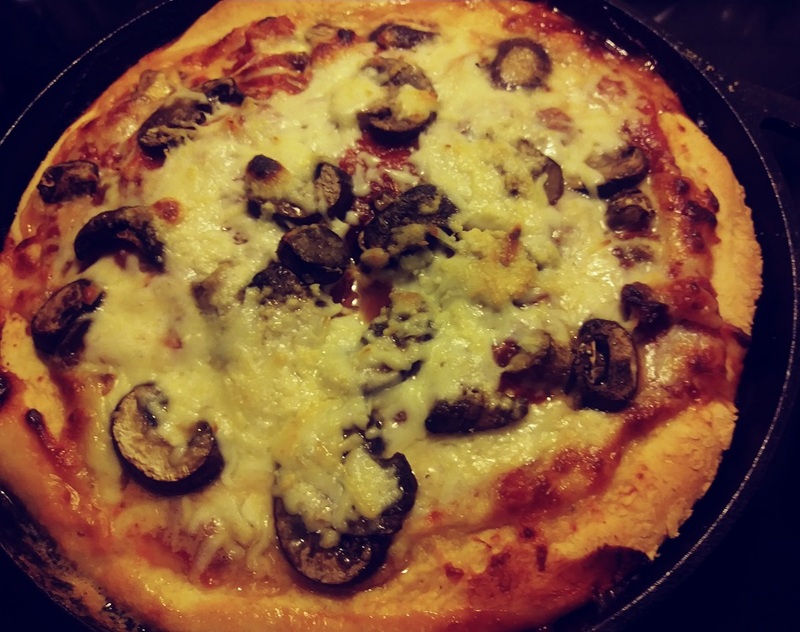 I made this one with Italian sausage, pepperoni, fresh mushrooms, and mozzarella cheese. So, I'll call this one a deep dish meat lovers pizza. First, I dissolved the yeast by adding the warm water and dry yeast into my KitchenAid Stand Mixer bowl. While waiting for that to happen, in a separate bowl I mixed together the flour, cornmeal, basil, salt, and sugar. Then, I added the olive oil to the water and yeast. 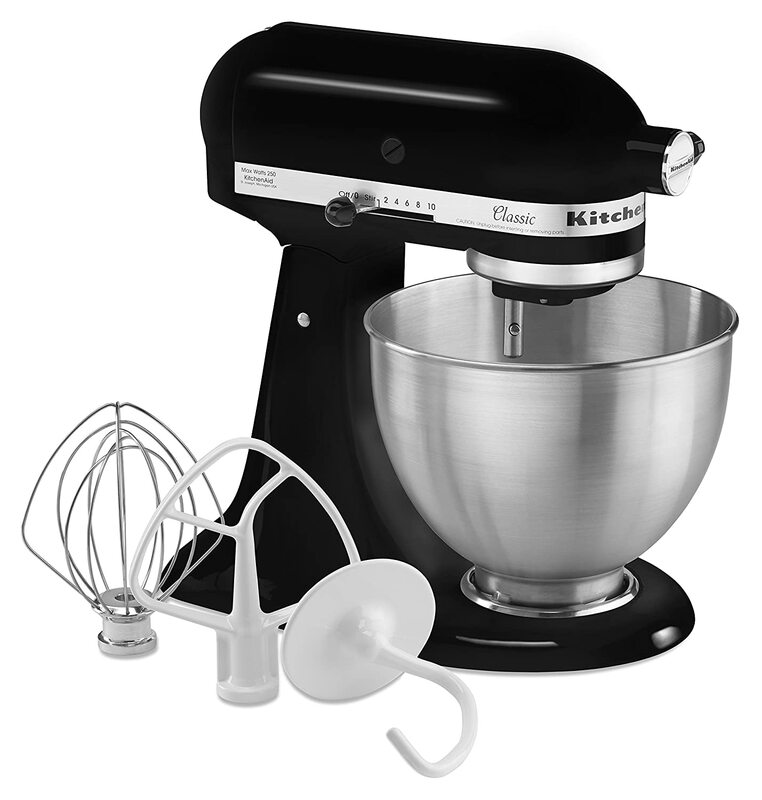 I began adding one cup of the dry mixture at a time while mixing with the dough hook. 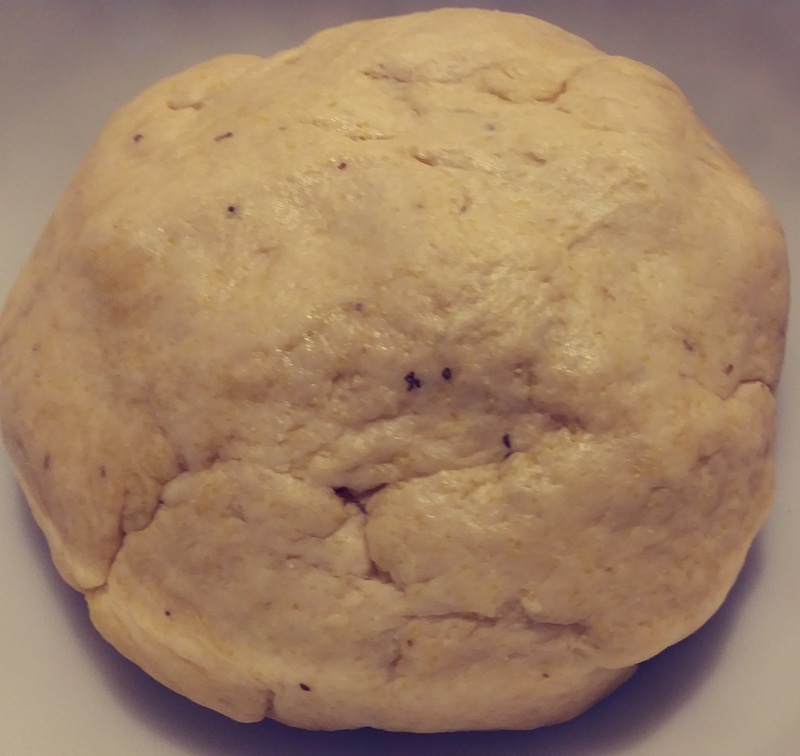 When the ball of dough was formed I kneaded the dough by hand on a floured surface turning it over about five or six times. Lightly coat it with oil put it in a covered bowl in a warm place and let it rise for about one hour. I mixed all of the sauce ingredients together in a medium bowl and set it aside while preparing the toppings. The dough recipe is enough to make two deep dish pizzas so I divided it in half. I used the other half to make a regular pizza. I spread half of the dough into the bottom of my greased 10-inch cast iron skillet and worked it up the sides. I layered the bottom with shredded mozzarella, added some sauce and then the sausage and pepperoni. Next, I added a little more sauce and the mushrooms then a little more sauce over the mushrooms and more shredded mozzarella. Then sprinkled the Parmesan and Romano cheese over the top. I didn't fill it all the way to the top as it will rise while it's cooking. 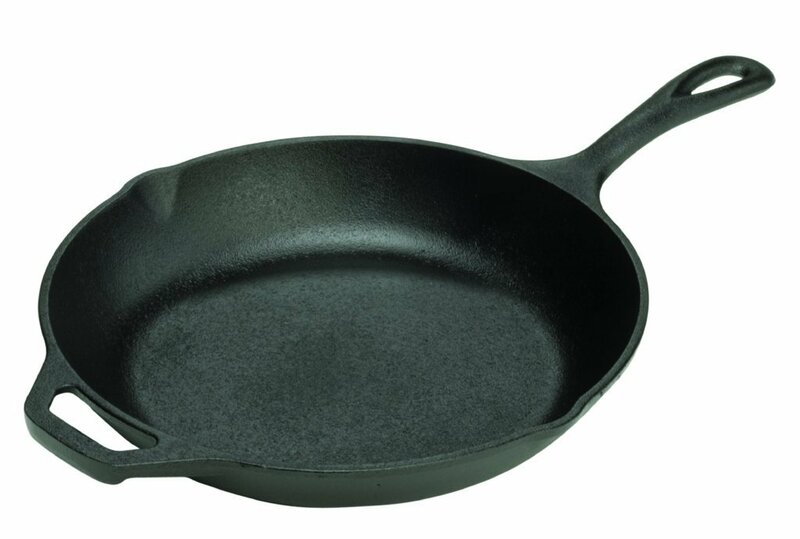 It's a good idea to place a cookie sheet under the skillet while cooking just in case it spills over. I covered the pan with tinfoil and baked it on the center rack at 450 degrees for 20 minutes. Then Baked for 12 more minutes uncovered until the edges were golden brown. 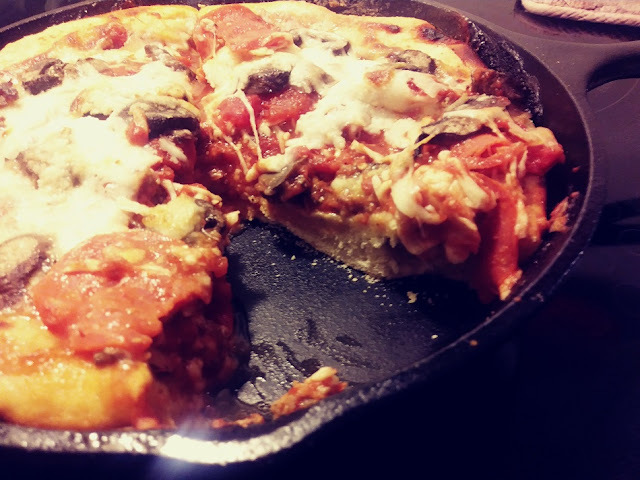 My first cast iron skillet deep dish pizza was a huge success. One nice slice of this about makes a complete meal.